* Eph 4:15: Vulgate: „veritatem autem facientes in caritate”. Also quoted by Daniel Ernst Jablonski on p. 121. In Leiden, on November 27, 1719. 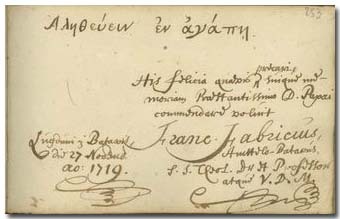 Franciscus Fabricius was born in Amsterdam on April 10, 1663, the son of the pastor Johannes F. and of Katharina Felbier. At the age of five he lost both of his parents, and was educated by his maternal grandfather. He learned Oriental languages in Amsterdam, then in 1681 went to the university of Leiden. In 1687 he became a pastor in Velsen (Noord-Holland), where he got married in 1690. In 1696 he became a preacher in Leiden. In 1705, at the death of Jacobus Trigland (1652-1705) he followed him at the faculty of theology of the university and in the office of supervisor of the schools of the Netherlands. At this time, in order he could dedicate himself better to university duties, he renounced half of his preacher's work and salary. He was rector of the university of Leiden for four periods. In 1716 he was elected a member of the English Royal Society for the Propagation of the Gospel. He lectured in dogmatics in a somewhat controversial Cocceian spirit, but he focused mainly on practical theology, principally on homiletics. The title of professor of homiletics (professor eloquentiae sacrae) was created directly for him in 1722 at the Leiden university, after he had taught this subject for many years. His speech delivered in the St. Peter's of Leiden in 1725, on the 150th anniversary of the Leiden academy, became very celebrated. He died in Leiden on July 27, 1738. The funeral oration was told by professor Jan van den Honert, the son of Taco Hajo van den Honert. Some of his important works are: De Christo unico ac perpetuo ecclesiae fundamento, 1705, 1717. – De oratore sacro, 1722. – Oratio in natalem centesimum et quinquagesimum, sive annum jubilaeum tertium academiae Batavae, quae est Lugduni-Batavorum. Leiden, 1725. - Opera omnia philologico-theologica, exegetica et oratoria, Leiden, 1740. 4 vol. – Our Library preserves a dissertation of 1736 defended in Leiden under his chairmanship by Bernhardinus de Moor. In his note written in Leiden Franciscus Fabricius indicates both his titles of professor and pastor (V.D.M. ), and regards it important to emphasize that he originates from Amsterdam: Amstelo-Batavus. – The next note in the album, written on the same day, is from professor Taco Hajo van den Honert (p. 257).